"Spiegelman's drawings are like demonic woodcuts: every angle, line, and curve jumps out at you. Stylishness and brutishness are in perfect accord." Art Spiegelman's sinister and witty black-and-white drawings give charged new life to Joseph Moncure March's Wild Party, a lost classic from 1928. The inventive and varied page designs offer perfect counterpoint to the staccato tempo of this hard-boiled jazz-age tragedy told in syncopated rhyming couplets. Here is a poem that can make even readers with no time for poetry stop dead in their tracks. Once read, large shards of this story of one night of debauchery will become permanently lodged in the brain. When The Wild Party was first published, Louis Untermeyer declared: "It is repulsive and fascinating, vicious and vivacious, uncompromising, unashamed . . . and unremittingly powerful. It is an amazing tour de force." Joseph Moncure March was a poet, journalist and screenwriter best known for his two verse narratives, The Wild Party and The Set-Up, the story of a washed-up black boxer. An editor for The New Yorker in the 1920s, he died in 1977.
of avant-garde comics, and is currently a staff artist for The New Yorker and comix editor at Details magazine. He is currently working on Crime Doesn't Pay, an opera libretto about the history of comics. He lives in New York City with his wife, Françoise Mouly, and their two children, Nadja and Dashiell. 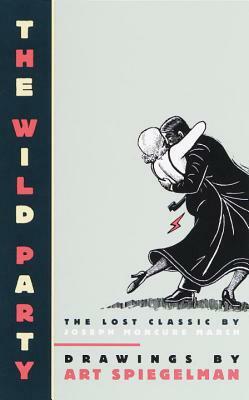 "The Wild Party?. . . It's the book that made me want to be a writer." The Wild Party may have begun as a dark Prohibition-era morality fable, but, thanks . . . to Spiegelman, it lives again as a funhouse mirror of current fears."